A red Paratroopa in Super Mario Run. 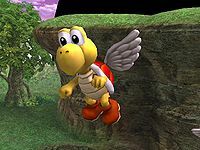 A Koopa Paratroopa (パタパタ, Patapata), often just called a Paratroopa, is a winged Koopa Troopa, an enemy character from the Mario universe. 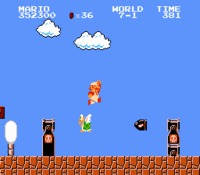 Mario jumps over a Koopa Paratroopa in Super Mario Bros.
Koopa Paratroopa made their debut in Super Mario Bros., and made frequent reappearances in later games. Green Paratroopas either fly back and forth in a fixed path or hop around, while red Paratroopas fly up and down. Jumping on them makes them lose their wings, turning them into regular Koopa Troopas. Super Mario World gave Koopa shells different powers when eaten by Yoshi: in particular, eating a Red Shell gives him the ability to spew fireballs. Koopa Paratroopas are found in the Mushroom Kingdom stage of Super Smash Bros. Melee's Adventure Mode, as well as in Crates and Barrels. 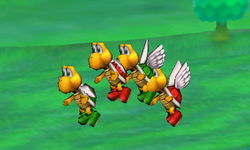 Jumping on them or attacking them in midair makes them lose their wings, turning them into regular Koopa Troopas. While Green Koopa Paratroopas are common, only one Red Koopa Paratroopa appears in the entire stage, in the area with water before the fight against Yoshis. This Paratroopa's red shell deals fire damage when it is thrown; beyond this, however, it otherwise acts identically to a Green Shell. Every time the player KOs a Koopa Paratroopa by grabbing it and throwing it, or knocking it off a ledge, some points are added to the Koopa Paratroopa KO bonus. A red Paratroopa in the Subspace Emissary. Green and Red Koopa Paratroopas are common enemies found in the Subspace Emissary mode, first seen in The Jungle. They do not deal damage on contact, but actively attack nearby players with a downward headbutt. Some of the Red Koopa Paratroopas even chase their targets, and strike when they get close. If attacked or stomped, they lose their wings and fall (provided the attack caused them to flinch), acting from that point on no different than a regular Koopa Troopa. Their health bar, however, will still read "Paratroopa". Red Koopas (without wings) just follow their target on foot, though they're slow and easy to escape from. After a while, if not destroyed, they can grow back wings when they go off-screen. If it is knocked out in one hit (i.e. it doesn't lose its wings), it will reel normally like a defeated enemy instead retreating into its shell. This does not happen to regular Koopa Troopas. It is somewhat tough to catch their Trophies with a Trophy Stand, because a single hit may remove their wings and turn them into a regular Koopa. The player can damage them, move away from them until they aren't visible, and return to their position, making their wings return. 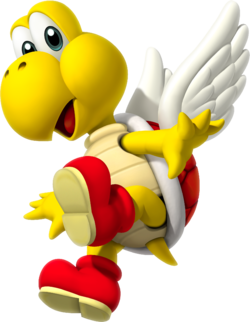 A winged Koopa. These can fly to a degree, but in Super Mario Bros., it wasn't like they could soar wherever they pleased. In fact, they merely hovered, moving back and forth over set areas. Some Koopa Paratroopas don't even take to the skies, but just jump up and down. These become regular old Koopa Troopas when stomped. A flying Koopa with wings. In Super Mario Bros., they possessed the same abilities as green-shelled Koopa Paratroopas, but the routes they flew were different--they flew up and down rather than side to side. There are no red-shelled Koopas who merely hop up and down. You'll often see them participating in two-person kart races and playing basketball. Red and green Koopa Paratroopas on Golden Plains Ω. Red and green Koopa Paratroopas appear as enemies, retaining their Brawl properties. They also appear as part of the enemy waves in the Mario-themed Vs. Enemy Team final battle. Like in Brawl if they are hit by a really strong attack they will be KO'd instead of becoming a normal Koopa Troopa. The Green Koopa Paratroopa is exclusive to Super Smash Bros. for Nintendo 3DS. These green-shelled Paratroopas from the Mario series come in two varieties: ones that jump toward you, and ones that float in the air until they're swatted down. When you stomp or damage one in Smash Run, it'll lose its wings and be transformed back into a normal Koopa Troopa. These green-shelled Paratroopas from the Mario series come in two varieties: ones that jump toward you, and ones that float in the air until Mario swans over and jumps on them, using them as a platform. 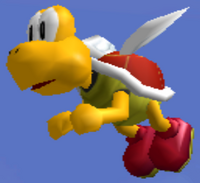 When you stomp on or damage on in Smash Run, its wings fall off, turning it back into a normal Koopa Troopa for good. The Red Koopa Paratroopa appears in both versions. In Super Smash Bros. for Wii U it is part of the Bowser's Minions Trophy Box. The red-shelled Paratroopa. Many a time Mario has used these flying turtles as a stepping-stone to victory. In Smash Run, they have better agility than their green brethren but are largely similar. If you defeat them, their wings will fall off and they'll become regular Koopa Troopas again. Many times have Mario and his friends treated these red-shelled Paratroopas as little more than winged platforms. In Smash Run, they're a lot like green Paratroopas, except a little bit more aggressive. When you attack or stomp on one in Smash Run, its wings fall off, turning it back into a normal Koopa Troopa for good. These winged foes tend to fly right in front of high places Mario wants to reach, so it isn't all that surprising that he constantly uses them as stepping stones. Jumping on them knocks their wings off, turning them into regular Koopa Troopas. These guys are surprisingly adaptable: they play tennis and basketball, and they can even drive! The Green Koopa Paratroopa trophy in Brawl states that it appears in Mario Hoops 3-on-3. However, only the Red Paratroopa does. This page was last edited on November 13, 2018, at 15:44.